Outlook: New Jersey authorized several forms of online gambling in February of 2013, including Internet poker. The state’s officially-authorized sites have yet to debut, but are expected to open for business at some point in 2014, with all 12 of the state’s land-based casinos seeking to put their brand names on state-authorized online sites. Details: New Jersey’s push to legalize online poker and other forms of Internet gambling has moved forward haltingly in a process spanning several years. 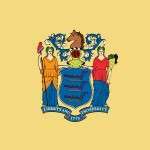 At one point, it appeared that New Jersey might become the first US state to authorize state-regulated online poker, even before Nevada, though both Nevada and New Jersey’s neighbor Delaware both beat New Jersey to the punch, before the state came around in February of 2013 when Gov. Chris Christie signed an authorization bill into law. The process wasn’t nearly that easy. New Jersey’s gambling and tourism economy has been in decline for fully two decades, with the historic East Coast gambling mecca of Atlantic City (home of the famed Boardwalk) facing year after year of declining gambling revenues. • Perhaps most importantly, the proliferation of gambling opportunities in nearby states. From three racinos in neighboring Delaware to slots casinos in eastern Pennsylvania and two mega-casinos on the other side of the New York City metroplex in Connecticut (Foxwoods and Mohegan Sun), Atlantic City casinos found themselves a much less desirable destination. New Jersey casinos and their legislative supporters have long eyed Internet gambling as a way for the state to reestablish its supremacy. NJ State Sen. Ray Lesniak, an outspoken supporter of the state’s casinos, introduced an authorization bill in early 2011. That first bill sailed through both the New Jersey Senate and Assembly with significant majorities, and appeared ready to be signed by Gov. Christie. Instead, Christie unexpectedly vetoed the bill, suggesting that a clause in the bill declaring sites with their servers based in Atlantic City but open to all Jersey residents might be unconstitutional, since the state authorizes only the gambling which occurs in Atlantic City. However, such concerns disappeared when later bills were passed; it appears that Christie dealt with Lesniak’s original bill in the context of his own national, Republican-party political aspirations, and did not want New Jersey to be the first state to authorize online gambling. A second bill authored by Sen. Lesniak in late 2012 and introduced in the New Jersey Assembly as AB 2578 (by sponsors John Burzichelli, Vincent Prieto and Ruben Ramos, Jr.) again sailed through related committee and Assembly and Senate votes, usually with voting majorities approaching 90%. But again, in early 2013, Christie vetoed the bill, but said he’d approve if it in exchange for a higher tax rate to be assessed to the New Jersey casinos to be operating the sites, along with a 10-year limit on the licenses to be issued by the state, to allow for periodical review. The temporary veto also gave Christie’s political team time to parse the debate away from another New Jersey gambling situation, where the state has been involved in pitted constitutional battle against federal officials in its plan to offer legalized sports betting, which is legal in Nevada and has proven a boon for that state’s casinos. In any event, the online-gambling bill’s bakers quickly agreed to Christie’s demands, and a revised version of the bill had cleared both legislative houses and was back on Christie’s desk within three weeks, which he then signed the same day. The first New Jersey-regulated sites have yet to appear, but it’s likely they’ll debut for real-money play sometime in early 2014. All 12 land-based casinos in Atlantic City have notified state regulators of their plans to launch one or more online poker sites for New Jersey players. Our sister site NJ Casinos regularly keeps up to date on the market changes in the Garden State. One extra wrinkle in the New Jersey online poker scene is in its possible point of reentry into the US poker market for world leader PokerStars. In late 2012, Stars parent Rational Group agreed to purchase the struggling Atlantic Club Casino for a paltry $15 million, with an eye toward using the site as a relaunching point for US operations, if the purchase could gain regulatory approval. Instead, the planned purchase was immediately assailed by the American Gaming Association (AGA), and important casino-lobbying group representing most (but not all) US-based casino/entertainment corporations. The AGA publicly and loudly protested against the potential approval of the Stars purchase, and took the unprecedented step of attempting to interfere with New Jersey regulators’ approval process by submitting thousands of pages of documentation purporting to show PokerStars as an international criminal organization with a history of flaunting US law. Not long after, the Atlantic Club Casino announced a cancellation of the attempted PokerStars purchase, citing the technicality of a lapsed timeline. The Atlantic Club also kept at least $11 million of the purchase price, and wants the rest. The dispute has triggered a lawsuit between the two sides. Meanwhile, PokerStars wasted no time reaching a software deal with a second New Jersey casino, Resorts Casino Atlantic City, to provide a software platform for online poker. The Resorts Casino Atlantic City casino is the only “Resorts Casino” venue in the United States -not- run by Resorts Casino International, the firm PokerStars originally contracted with in its attempt to purchase the nearby Atlantic Club. The AC “Resorts” property, once owned by Resorts Casino International, was divested by the group last decade in the face of a possible closure and mountains of corporate debt, and is operated today by the Mohegan tribe of Connecticut, which also runs that state’s giant Mohegan Sun complex. After much speculation, PokerStars finally announced – and rather quietly – that they would be running a soft launch in New Jersey on March 16th, limiting game play to just 8 hours a day through March 20th. As many as 500 players will be allowed to participate in the soft launch leading up to the Stars opening the site up for round-the-clock game play on March 21st. From then on out, the proverbial flood gates will open up to New Jersey poker players, and it is expected that PokerStars will most likely surpass sites like 888 and WSOP.com as the premier online poker option in the state. There’s no estimates on actual real money traffic that Stars is expecting, but it wouldn’t be surprising to see it come close or exceed to 500 to 1,000 active users on the site during peak times. Players who previously had a PokerStars account will be allowed to have their old accounts reinstated automatically. On top of that, old players who reinstate their accounts will also have their prior VIP status restored as well. Old FPP’s will also be converted into StarsCoins, which can of course be used towards additional rewards in the VIP store. As of the writing of this article, there are several major online poker sites operating in New Jersey. WSOP.com, PartyPoker NJ, Borgata Poker and 888 Poker NJ are currently the featured online properties in the state. However, the aforementioned PokerStars will be joining the party in March 2016 and is expected to be a major player in the market. According to data aggregator PokerScout.com, 888 and WSOP.com dominate the NJ real money traffic scene, with over 400 players online during peak hours. WSOP.com is actually powered by 888’s software and share player pools. It will be interesting to see how long those figures hold after PokerStars enters the fray.